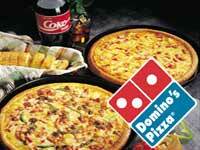 Domino's Pizza franchise business opportunity. 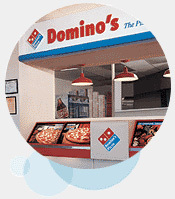 Free Domino's Pizza business franchise information. 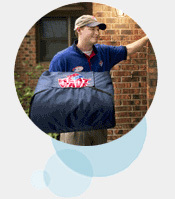 Our strong operating model, history of industry innovations, corporate support teams, delicious pizzas and side items and ability to take great care of our customer are just some of the reasons Domino's Pizza is an excellent place to franchise. Since our inception in 1960, Domino's Pizza has grown from one store in <?xml:namespace prefix = st1 ns = "urn:schemas-microsoft-com:office:smarttags" />Ypsilanti, Michigan to more than 7,500 stores in the United States and more than 55 international countries. As the number of stores increased, so did the options on our store menu. We've added CinnaStix, Buffalo Wings, Domino's Pizza Buffalo Chicken Kickers, Cheesy Bread, Salads and more to round out a pizza meal. Domino's success has come from a system with more than 85% of its stores as franchise units - and our goal is to have successful franchisees and stores. We work hard to build and maintain strong relationships with our franchisees with worldwide conventions, local group meetings, one-on-one meetings, franchisee advisory boards, open communication and publications that promote best practice sharing, positive energy and strategic planning so the company and our franchisees can achieve success together. To learn more about the Domino's Pizza food franchise opportunity, simply complete the form below.